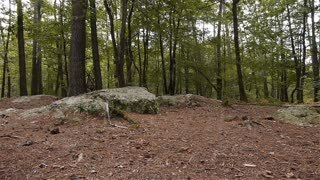 Stonehenge prehistoric monument Amesbury England pan 4K 017. 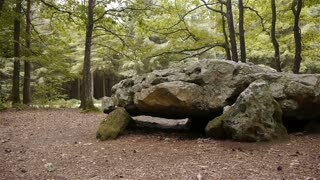 Prehistoric monument 3000 BC. UNESCO's World Heritage Site. Myths and mysteries surround the stones, no written knowledge remains. Major tourism attraction. A wooden statue of a druid and a wooden circle stand across the road from a craft shop. 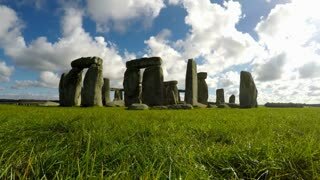 Stonehenge Monument Stones Summer Tourism England 4K 1417. Prehistoric monument dating to 3000 BC. UNESCO's World Heritage Site. Myths and mysteries. Tourism attraction. Sheep In Green Field Near Stonehenge England 4K 1410. Prehistoric monument dating to 3000 BC. UNESCO's World Heritage Site. Myths and mysteries. Tourism attraction. 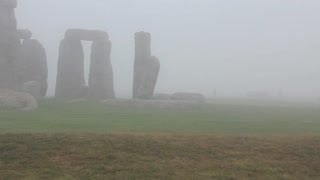 Stonehenge Monument Summer Tourism England Crow 4K 1434. Prehistoric monument dating to 3000 BC. UNESCO's World Heritage Site. Myths and mysteries. Tourism attraction. Stonehenge Summer Tourist At Monument England 4K 1442. 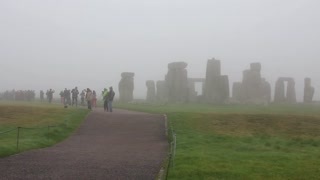 Stonehenge prehistoric monument 3000 BC. UNESCO's World Heritage Site. Myths mysteries. Tourism attraction bring millions of tourists. 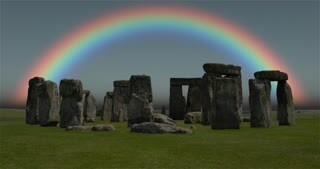 A rainbow over Stonehenge on a grey rainy day in the UK.